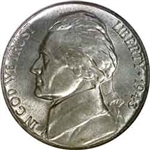 The Jefferson Nickel's design since 1938 has featured a profile of President Thomas Jefferson on the obverse. 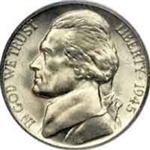 From 1938 to 2003, Monticello was featured on the reverse. 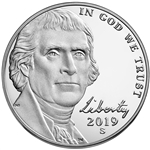 For 2004 and 2005, nickels featured new designs to commemorate the bicentennials of the Louisiana Purchase and the Lewis and Clark expedition; these new designs were called the Westward Journey nickel series. 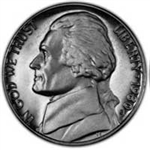 In 2006, Monticello returned to the reverse, while a new image of Jefferson facing forward was featured on the obverse. 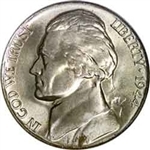 Good - (G4) - The rim is worn to the letters and the portrait is flat. Very Good (VG7) - The 2nd porch pillar from the right is almost gone, others weak but visible. Fine (F12) - The cheekbone is worn flat. The hairlines and eyebrows are faint. 2nd pillar is weak especially near the bottom. Very Fine (VF20) - The 2nd pillar is plain and complete on both sides. Extra Fine (EF40) - The cheekbone, hairlines and eyebrow is slightly worn but well defined. The base of the triangle above the pillars is visible but weak. Almost Unc (AU50) - There are traces flight wear on only the high points of the design. Some mint luster is present.